The Cowes Hammerhead Crane Trust was formed in 2006 seeking to preserve this iconic tribute to England's early industrial design engineering and as a symbol of the importance of Cowes', the Island's and England's, engineering and shipbuilding heritage. We focused on actions to preserve the structure of the crane, such as increasing the protection levels to a grade II star listed structure on the English Heritage 'at risk' list and conducting structural inspections. As we worked with English Heritage and the Island's conservation team we learnt what engagement and support to the community really meant - we have matured. Our aspirations have widened. We know we can do more, 'Making this important past part of our future'. We are promoting the 1912 Hammerhead Crane as our 'brand', not only to restore the crane, but to inspire young people to take up careers in engineering and heritage related fields such as craftsmanship, restoration or heritage tourism. We want to 'seed' youngsters into their own business start-ups in these areas, thereby generating further employment opportunities. We see the crane, already a key landmark, in it's heritage community setting, the focus of community adhesion, a venue for events, activities, and enabling people to enjoy the historic waterfront. But we need help. The crane is in need of urgent repair. English Heritage has offered to support Isle of Wight Council by underwriting the costs up to £90,000 of serving an Urgent Works Notice on the owners to address the most rapidly deteriorating elements of the crane. For this the Council would have to contribute 20% at £18,000. English Heritage and the Cowes Hammerhead Crane Trust have urged the Isle of Wight Council to undertake all actions within its powers now to ensure this iconic Crane is saved and restored as a key part of the Island heritage giving its past a rightful place in its future. Unfortunately due to financial constraints the Council is unwilling to find the 20% contribution. The Cowes Hammerhead Crane Trust has now launched its own appeal for funds so that it can contribute to the costs of the Urgent Works Notice. Please help us raise the £18,000 to get the urgent works carried out. If you are able we have provided a gift aid application form to enable us to take advantage of the Revenue Departments support for charitable donations. The largest ever research project into the condition of England's industrial heritage was published on the 18 October, 2011 by English Heritage together with its annual Heritage at Risk Register. The research project into the condition of England's industrial heritage reveals that: nationally, almost 11% of grade I and II* industrial buildings are at risk making them three times more at risk than grade I and II* buildings as a whole. They make up 13% of all buildings on the Heritage at Risk Register. Of all the entries on the Register in the South East, some 4% are at risk (20 industrial sites). In the South East, 38% of industrial heritage sites at risk are maritime structures such as shipping and naval dockyards. The iconic 99 year old Hammerhead Crane on the Isle of Wight, which should be a proud example of the island's engineering heritage, is seriously at risk of decay and is in danger of collapsing into the Medina River. The Cowes Hammerhead Crane Trust was formed in 2005 as a company limited by guarantee and a registered charity to be the voice of the Crane to ensure that is restored as a fully functioning Crane in it’s historic public space setting and that it is preserved in perpetuity for the people of the nation. The challenge is how to make the Crane, and the maritime heritage it represents, mean something to people today and for the future. The 1912 80 ton hammerhead Crane was ordered by Cowes shipbuilder J.S. White in 1911 and came into use the following year. It was the key element of a new fitting-out quay, as part of White's increased capacity for the production of naval warships. The Crane was designed by Babcock and Wilcox and engineered at their Renfrew plant, but it was the only giant cantilever Crane they ever built. This type of Crane would eventually dominate the skyline of shipyards throughout the world. 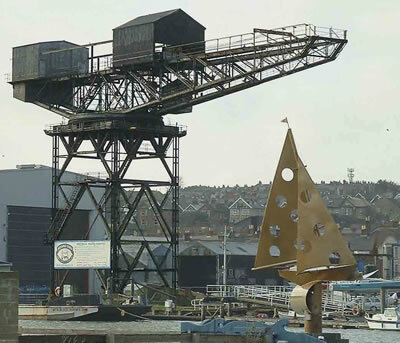 The Cowes structure falls within the first decade of their development and the Crane is probably the earliest example in existence beyond the Clyde, and the only remaining pre-WW1 hammerhead crane in England. Two warships that were built under the crane are still in existence; HMS Cavalier preserved at Chatham, and the Polish Navy’s destroyer ‘ORP Blyskawica’ preserved in Poland. The 1912 hammerhead dockyard crane at Cowes is a magnificent symbol to all of what the Island is capable of achieving and of the many ships that Cowes and the Island have built. The Crane has been out of use since 2004. The findings of two engineering surveys carried out in 2005 and 2009 show that the Crane is structurally sound. The Cowes Hammerhead Crane was listed Grade II on the 2nd August 2004 through the good efforts of the Isle of Wight Industrial Archaeological Society, upgraded to a Grade 11 star 30th October 2007, and placed on the English heritage ‘At Risk’ list July 2008. The 1912 hammerhead Crane is likely to be the only reminder of Cowes’ marine industrial heritage; standing proud on the Cowes skyline, a landmark looking down over the approaches to Cowes, the Solent and the Medina River. The Crane is a magnificent symbol to all of what the Island is capable of achieving and of the many ships that Cowes and the Island have built. The challenge is how to make the Crane, and the maritime heritage it represents, mean something to people today and for the future. The diagrams below indicate some of the engineering features of the crane. Understanding how the crane was designed in 1912 is one of objectives of the Trust so that people can understand the history and evolution of technology that built the nation. The significant event for the Trust this year has been the Condition Survey carried out by Consulting Engineers Hockley & Dawson of Cranleigh in Surrey. The survey was funded 90% by English Heritage. The last inspection was carried out on 2005 and found that although maintenance and repair works were required the crane was structurally sound. Now 4 year later there are indications of deterioration and holding repairs are necessary on a lot of the minor struts and bracings. In 2009 the Trust , sponsored by Doosan Babcock Energy (previously Babcock and Wilcox), the company who originally designed and built the crane in 1912, arranged an art competition for pupils at the Island’s schools so that they could become inspired by our Island’s maritime heritage embodied in the 1912 Hammerhead Crane. The competition was designed to enable pupils to learn in a practical, creative and innovative way about the Island’s industrial maritime history and how this maritime heritage develops our thinking and becomes part of our future. We held the prize giving ceremony on the 1st October and most of the children, their parents and teachers came along. As you can see from the photographs below the competition went very well and we had in excess of 30 entries for the artwork and modelling. We were fortunate in having Mrs Gay Edwards, the Isle of Wight High Sheriff to give away the prizes. We were also fortunate with Dame Ellen MacArthur and ‘Forget-me- not, a local arts shop, contributing prizes. The actual event was held in a professional theatre at the Quay Art centre in Newport with full audio/visuals and all the paintings and models exhibited both physically and electronically for all to see. It was a lot of fun, and of course with a bit of pomp and ceremony to mark the occasion. The competition was launched to inspire the children, reinforced by the key message that the sheriff gave: “we want to see you growing up knowing the history of the island and the contribution we made to shipbuilding. But we want more than that. We want you to be inspired by our islands history so that as you continue through school you can be more aware of the opportunities life can present for you. Think of the ships that we built. Think of how we led the world in engineering design. Think of what you may want to do”. This message supports our Trust’s objective of educating the public on the contribution that the maritime industry has made to the nation, and how this heritage can guide younger people into engineering fields for the future. ‘Making the past part of our future’. Making the past part of our future calls for engagement with children of all ages to give them inspiration in thinking of opportunities for careers in engineering. We have created ‘Sammy’ the crane to appeal to younger children. Sammy is named after John Samuel White who established a major shipbuilding in Cowes in 1838 and who ordered the construction of our Cowes Hammerhead Crane in 1912. So where does the Trust go from here. We have raised the profile of the crane on the island. People are beginning to appreciate the crane as a landmark. We have learnt more about how to inspire people. Now we need to progress the recognition of the engineering aspects of the crane, the physical steel structure, its design, the electrical systems, and how this can open student’s eyes to their future employment opportunities. The Trust continues to work with Peter Harrison, the owner of the riverbank site on which the Crane sits, who has included the crane as the focal point the overall design. The current financial recession has delayed the development as property prices have dropped and viability of the overall development is in question. The key issue that the Trust is considering is how to raise funds for the interim repairs that have been identified to slow down the deterioration of the crane whilst the site development is approved. The Trust continues to have excellent support from the Isle of Wight Industrial Archaeological Society, the IoW Council, English Heritage (EH) and the Architectural Heritage Fund (AHF). Interested to join or help the Trust?